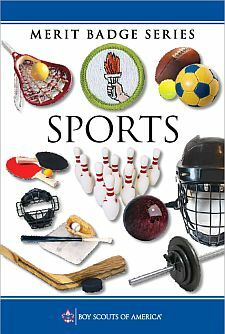 Note: The activities used to fulfill the requirements for the Sports merit badge may not be used to help fulfill requirements for other merit badges. Explain to your counselor the most likely hazards you may encounter while playing sports, and what you should do to anticipate, help prevent, mitigate, and respond to these hazards. Show that you know first aid for injuries or illnesses that could occur while participating in sports, including sprains, strains, contusions, abrasions, fractures, blisters, muscle cramps, injured teeth, dehydration, heat and cold reactions, and concussions or other suspected injuries to the head, neck, and back. Create a chart and use it to track your training, practice, and development in these sports for one season (or four months). Demonstrate proper technique for your two chosen sports. At the end of the season, share your completed chart with your counselor and discuss how your participation in the sports you chose has affected you mentally and physically. Give the rules and etiquette for the two sports you picked. List the equipment needed for the two sports you chose. Describe the protective equipment and appropriate clothing (if any) and explain why it is needed. Draw diagrams of the playing areas for your two sports.